Looking at Historic Neighborhoods — Columbia Heights | Park View, D.C.
« Why Do We Have Heritage Trails if We Don’t Maintain Them? From September to December of 1940, the Washington Post published a series of articles focusing on the Citizens’ and Civic associations of Washington. A review of the articles are interesting for a number of reasons, not the least being that most include maps showing the areas served by the associations which help illustrate neighborhood boundaries. Yet, even with this one needs to keep in mind that some areas were served by more than one association and that there are areas of neighborhood overlap. 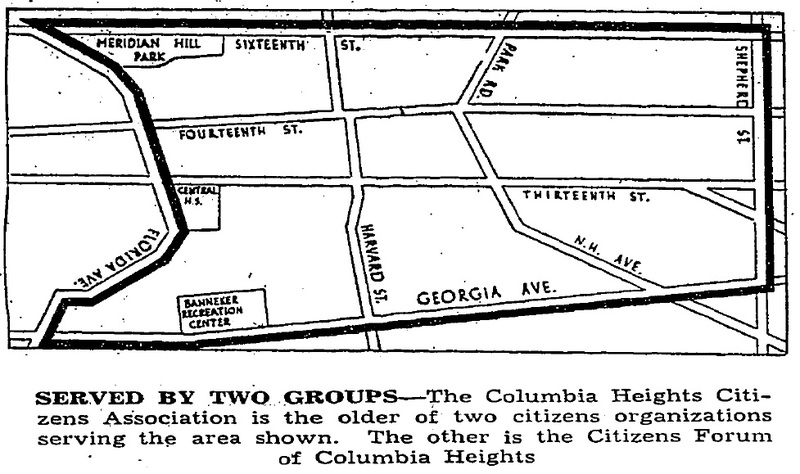 As neighborhood boundaries are something that many Washingtonians find interesting, beginning with today’s post on Columbia Heights the series will be reprinted. The map above and article below were originally published in the Washington Post on October 14, 1940. You’ll noticed that the map goes as far north as Shepherd Street and includes areas today considered part of Pleasant Plains, Park View, and Petworth. This entry was posted on January 28, 2015 at 7:01 am and is filed under Community, History. You can subscribe via RSS 2.0 feed to this post's comments. Ken, what are the legal boundaries of Petworth, Columbia heights, and by default Parkview. I have always seen legal records that stop North columbia heights near Georgia and Upshur on the west side of the street. I also operated under the assumption that Parkview is a sub neighborhood of C. Heights extending from Sherman (or 11th?) Over to park along the fence of the soldier’s home.